With a fun twist on the classic 'jar presentation' that is typically reserved for special release cigars, La Flor Dominicana is delivering its next release in German-style beer steins! 2014 was a special year for LFD founder Litto Gomez Diez, marking his 20 years in the cigar industry. To celebrate, LFD introduced the 1994, a commemorative cigar that uses a Natural Mexican San Andreas wrapper over Dominican innards. But what about that stein? After seemingly endless delays, the LFD 1994 Beer Steins have finally arrived! This is a limited release version of the LFD 1994, arriving in a single vitola of 6 x 54 and sporting an alternate maduro wrapper not found on the regular 1994 cigars. LFD is known for creating a full-bodied smoking experience, but the addition of the Mexican San Andreas maduro wrapper adds a welcomed sweetness to this amazing cigar. 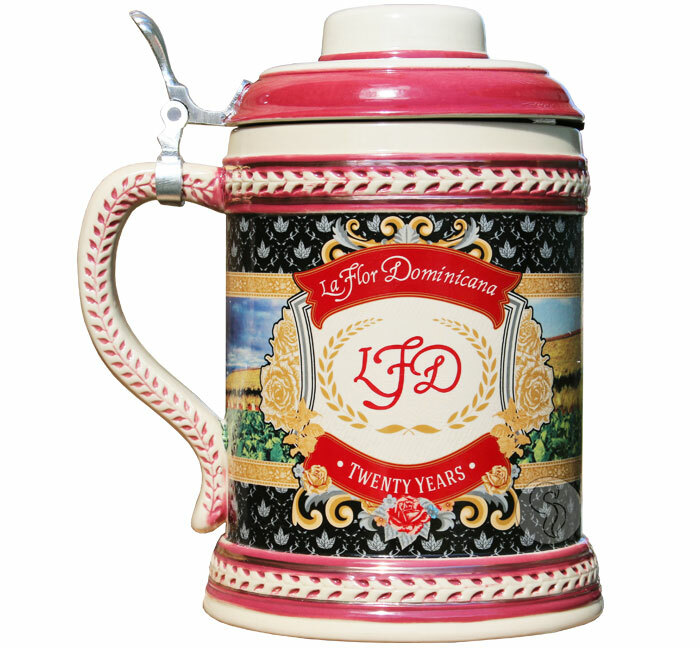 This is a limited release, grab your commemorative LFD Steins while you still can!